Tim Sherwood has compared himself to a supply teacher and claimed the uncertainty over his future has created a lack of respect among his players. 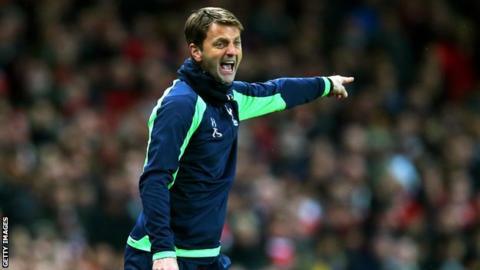 Sherwood took over as head coach at Tottenham last December after Andre Villas-Boas was sacked. But 45-year-old has worked against a backdrop of speculation over his job. "If you have a supply teacher who comes into your school, sometimes they're not treated with the respect that a headmaster is," Sherwood said. Sherwood made the statement after quotes attributed to Brazilian Sandro in which the midfielder claimed the Spurs boss would leave the club at the end of the season. Sandro has only made one appearance as substitute since he was dropped by Sherwood in March. Sherwood revealed Sandro, 25, is not the first player to have raised the issue about his future with him. "I have had a lot of players come to me and say their agents have told them that I'm not going to be here next year," Sherwood added. "I'm not sure if the chairman has spoken to Sandro but obviously someone has told him. "It is a very difficult situation but I have got to get on with it." Tottenham were most recently linked with Ajax coach Frank de Boer, although the club dismissed the reports as "wholly inaccurate".